You can buy a generic first aid kit from almost anywhere; climbing shops, Halfords (or equivalent car shop), supermarkets, even garages have them. Most people carry them too, out on the hill, from hillwalkers and mountaineers to paddlers and cavers, you’re normally not far away from someone who has one. The question i have is: how many boulderers have them? And for those that do, how much of what you carry is actually relevant? I take one – a hangover from my time on the mountain rescue team. After all, i’ve seen far more injuries bouldering (especially considering the number of participants) than with most other sports. The crucial bit for me, though, was to make my own with things that will actually help me and not just weigh me down. What surprised me was actually how little is in it, although after attending a first aid course i think i should probably add more to it. So i thought i’d go through what’s in my bag with you, explaining why it’s there and looking at some of the most common injuries. In turn, i might realise i’ve missed some really important and crucial items that i need to procure. I’d like to point out, though, before we start that this is not a definitive list – it’s probably not even a very good one! But if it makes you think (and me for that matter) and maybe means people start taking a few basics, then it can’t be a bad thing. I am also going to stress, very clearly right from the start, i am not going to tell you how to treat these injuries. There are a host of excellent first aid courses out there (i would recommend a REC course) and i am not qualified or experienced enough to go through treatment with you. All we are looking at are the tools to make life easier (or indeed longer in some cases) that you might take. Before we can see what items to take, we need to think about what we’re most likely to be treating. Heat stroke isn’t a major concern for example, and i’m assuming you’re not taking groups out and if you suffer from asthma or anaphylaxis, then you’ll be self medicating and looking after yourself, so no need for me to be taking a spare epipen or inhaler! We’re also not going to try and treat the really big injuries. If someone takes a pisser off the wall and cracks their head open with a serious head injury, we’re not interested in trying to evacuate them, but keeping them stable is crucial while we wait for help. After all, a lot of boulders are in quite remote locations and rescue can easily take a good few hours. To read the whole article, please click here. The point i’m making is that turning, straining, spraining or breaking an ankle is the most likely debilitating injury you’ll come across, so it’s the one we’ll need to think of first. SAM Splints are amazing things (look at the comments on the link there and discover they work on animals up to the size of a kangeroo!) that are easily packable and yet incredibly strong when in use. They are fantastic for immobilising a joint and assuming your crocked climber can weight bear on the limb, this could be the difference between being able to walk out or needing to call for more help. Incidentally, the help that arrives may just strap the joint in a SAM Splint and walk them off anyway… They’re also much easier than trying to improvise something out of various bits you’ve got kicking about. To keep the splint in place, you’ll need some sort of bandage and i’ve put crepe bandage on here. Another suggestion i received recently was a VET wrap bandage, originally designed for horses. I’ve been looking for these for years and they’re excellent in that they stick to themselves – so no more tucking ends in or stabbing patients with safety pins! I would carry either one of each or a couple of crepes. They’re incredibly useful for a large range of issues that we’ll come to later. It’s a natural reaction to throw an arm towards the ground as you’re about to impact – even after years of trying not to, i still do. When that wrist does hit the floor, especially off the pads, it can be nasty. You’re potentially looking at anything including strains, sprains, fractures, breaks or maybe even a dislocation or two. The other one worth mentioning is damage to the spotter. Many people spot (terribly) with both arms straight ready for the climber to pop both their shoulders out of place. Remember, it’s not just your climber who may come a cropper. Once again, for these, i’ve lumped the whole arm into one category as the treatment is the same and to be honest, it’s the same as with the lower limbs with one exception. Again, your SAM splint and crepe/VET wrap are the ones to go for here for any strains/breaks/etc. Once you’ve bandaged it all up though, it might make your casualty more comfortable for said limb to dangle in a sling rather than hanging loose. This is probably the easiest thing to improvise, if you’re reluctant to take another bandage, either in the front of your jumper, with another layer, a couple of Buff, whatever but personally, i take one anyway as they weigh little and can be used for other things. These could be fairly common and we very nearly had a very nasty one the other week but thankfully he stopped himself an inch short. Thankfully, in my experience, they’re not common, either from impacts or from it being shaken about during a normal fall. If, on the off chance, you do get someone bashing their head to such an extent you have to do something, you should already have the tools at your disposal – namely a crepe and a triangular bandage. There really isn’t anything else you really need. Head injuries should really be more about prevention rather than treatment so check your landings, utilise spotters properly and if necessary, wear a helmet. It’s rare but if you need one, no-one will think less of you. These are far more common; the type of thing you need to do something about but wouldn’t dream of calling for help for. Flappers are commonplace and session-stopping, and while i’ve seen plenty of cuts and grazes, i’ve never seen a boulderer cut an major artery or anything of that ilk. This is where the bulk of our kit comes in and most of you will probably take this regardless. The first is most definitely finger tape, often zinc oxide tape. Don’t get this from the chemist, get it from a climbing shop where it’ll be more designed for what you’re doing. It can also be preventative too, either for pulley tweaks or (and i’ve done this a few times) taping up to avoid the flapper from the crozzly hold in the first place. The other issue with flappers is the big bit of skin hanging off. For deep nasty ones, probably best to leave it on and tape over it but occasionally it’s worth removing the skin and then taping. I’ve seen quite a few options here. Personally i use a pair of nail scissors that are very handy. Former colleague Andy Marshall uses a very sharp penknife instead, which has more multiple uses if needed. The other thing that’s been suggested is a pair of nail clippers. There’s not really much reason not to take all three but take your pick. The other thing that’s worthwhile with cuts is Climb On or equivalent. I’ve been known to pack a small cut with it before, both to aid recovery and to prevent various nasties getting in. Again, this is probably one of those things that you carry anyway. Boulderers aren’t as good as most other outdoor enthusiasts at taking plenty of water so it’s also worth a mention. If you do get a nasty cut or graze, it could help to wash it out a bit and potentially a small packet of saline could also be useful for chalk or grit in eyes, as well as cuts. I’ve not bothered with the latter though. I regularly add other bits to my kit: there are plenty of sandpaper tools out there, like this one from Beastmaker, and chucking them in the first aid kit is as good a place to keep them as any. There are also little ring things that can massage the fingers, although i’m not sure who makes them or what they’re called. If you find one, chuck it in. Other than that it’s kinda common sense. For me, it’s a case of weighing up the probability of needing it with the hassle of taking it – a neck brace may come in very handy one day but i highly doubt i’d ever use it! However, it is definitely considering taking a few bits. 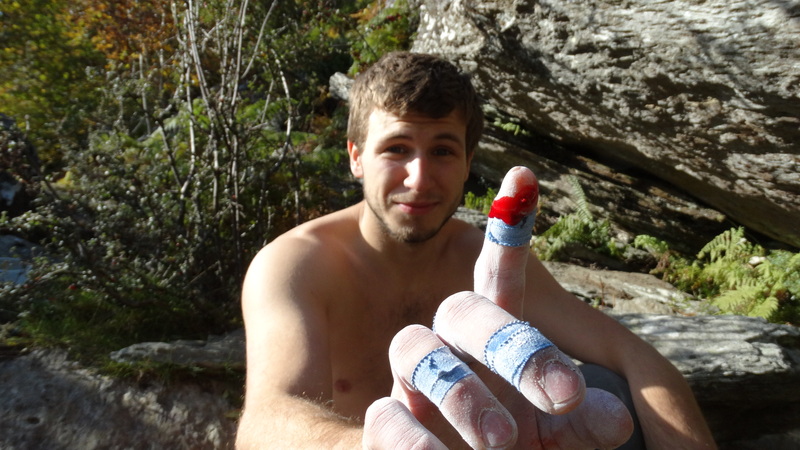 Accidents in bouldering do happen, and they can be really nasty. If you don’t believe me, click on this particularly gruesome link to see a friend of mine snap his tibia and fibula in Fontainebleau. (It is particularly nasty so not for the feint hearted. You have been warned.) Yes it is me “spotting” – after a similar accident the year before, we had all agreed no spotters and i ran off to grab… the first aid kit.